PNG’s budget challenges have been highlighted in a recent bank analysis of the impact of falling LNG prices (the ANZ’s Pacific Quarterly review of economic issues released on 23 Feb. – registration required). While the ANZ’s headline is that the PNG LNG project still gives the PNG economy a positive outlook, the bank’s detailed analysis of LNG pricing in the region shows an expected 42 per cent fall in prices in formula-based contracts such as those used in the PNG LNG project in the second quarter of 2015. This is forecast to reduce government revenue by K1.1 billion in 2016 – around 9 per cent of all domestic revenue. This commodity shock is especially challenging as there is also a major gap between funds allocated and existing government policy. We estimate the overall budget challenge for 2016 at K3,365m – over 20 per cent of planned expenditure levels (details below). The equivalent funding adjustment for Australia would be over AUD80 billion in 2016–and nothing like this is being contemplated in the Australian context. Since Paul Flanagan’s policy brief from late last year dealing with the impact of falling oil prices on the PNG economy, there has been a growing recognition that this external shock would impact adversely on PNG The initial responses to the article (apart from some unwarranted comments) claimed that PNG LNG sales were locked into long-term fixed price contracts so there would be no impact. Over time, however, it has become clear that while there are indeed long-term sales contracts, they use formula-based pricing, which links changes in prices for the Japanese Crude Cocktail to prices for PNG LNG – and so falling oil prices lead to falling LNG prices after a few months. Recently, the PNG Prime Minister himself has stated that the impact of the oil price fall should “not be underestimated” and that “hard decisions” may be needed. Just this week, the Treasurer has confirmed there will likely be a reduction in government revenue this year. The Central Bank has made similar remarks. All are to be commended for acknowledging the budget challenge PNG is facing. Can PNG meet its budget (and medium-term fiscal strategy) targets of a reducing deficit (4.4 per cent this year, 2.5 per cent next, and a balanced budget from 2017)? It will face two challenges. The first is the impact of falling commodity prices. Our earlier analysis had losses of revenue of over K1 billion from 2015 onwards. The more recent analysis from ANZ suggests the losses may be smaller in 2015 but K1.1 billion in 2016 and K0.7 billion in 2017. The ANZ figure of a K1.1 billion revenue loss in 2016 is used below. The second element of the budget challenge (not covered by the ANZ analysis but brought out by an earlier Devpolicy blog) is on the expenditure side. The following table summarises key sectoral expenditure figures from the 2015 Budget. Source: Table 11 p.52 of the 2015 Budget; inflation figures also from 2015 budget projections. What does this table mean? Assuming inflation of only 5% per annum (which is less, for example, than promised increases in teachers’ salaries), the government’s budget is forecasting massive cuts from 2015 to 2017 in areas such as education (by 26 per cent in real terms), in health (by 33 per cent in real terms) and in infrastructure (by 48 per cent in real terms). Cuts of this magnitude were put into the budget to eliminate the deficit by 2017. They would be difficult for any government to implement, especially in the run up to an election. And the Prime Minister’s Christmas message to the nation gave the opposite message: that current investment levels would be maintained. Clearly, the budget targets will be next to impossible to meet. For 2016, they would require finding (in expenditure cuts or revenue gains) K3,365m relative to the 2015 budget. This is obtained by adding the K1,100m hit estimated by ANZ from falling commodity prices to the K2,265m in expenditure savings in the table above (K16,199m less K13,931m). This is over 20 per cent of planned 2015 expenditure levels and over 27 per cent of domestic revenues. Likely, the aim to move to a budget surplus by 2017 will need to be abandoned – a realistic path towards fiscal sustainability is what matters, not an unrealistic target. Nevertheless, very hard choices will be needed. Given the speed of expenditure growth over recent years, sensible expenditure savings should be available, on both the operational and the capital side of the budget. (Why ANZ suggests cuts fall on operational spending is unclear. Our own analysis would suggest the opposite.) On the revenue side, one clear option is selling the Oil Search shares. How PNG deals with its budget challenge is an issue that needs serious policy consideration and community discussion within PNG now. We cannot rely on the hope that commodity prices will rebound to historic highs – the CEO of Exxon stated on 4 March his view that oil prices will stay low, and the Central Bank governor has confirmed this expectation. And the budget challenge must be faced at the same time as the exchange rate challenge and the monetary policy challenges. Failure to act will indeed lead PNG down a path towards crisis. 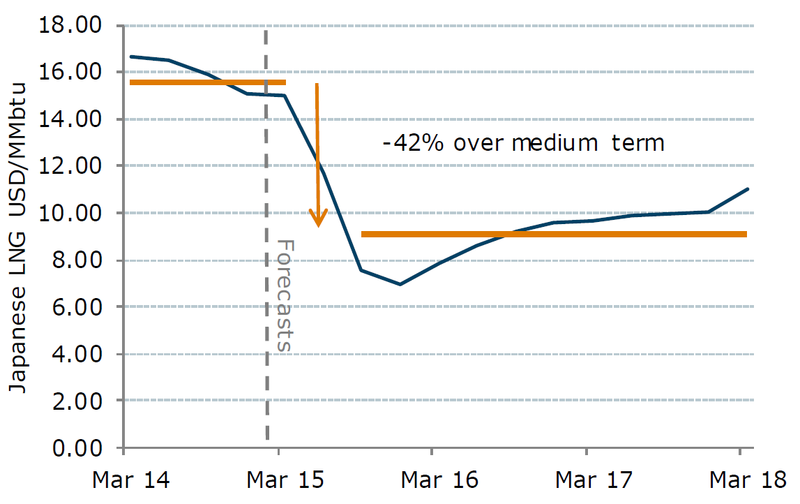 We should be grateful to the ANZ for its detailed analysis of LNG prices. Of course, as the bank points out, the LNG project is still a plus for the PNG economy. But the adjustment required will be challenging in the next couple of years. How PNG handles this will shape its medium- and long-term outlook. Paul Flanagan is a Visiting Fellow at the Development Policy Centre. Stephen Howes is Director of the Centre.